In August of 2014, I was fortunate enough to be asked to go to Australia by the company that I work for, to assist with a project. I was also blessed enough to be allowed to take my wife and children with me. Since this was to be our second trip out to the land down under, in as many years, I decided that this time I would contact a martial arts club to see if I can continue training whilst out of South Africa and away from Solis Ortus, since I wanted to keep as fit as possible for my Shodan grading due in 2015. Sensei Eugene has gracefully allowed me to do a two-part post about my experiences there relating to martial arts. As I typed in the keywords into Google to find a karate club located in Australia’s Sunshine Coast, in the state of Queensland, my eye caught the name “Combat Karate” in the results. Full of hope I clicked on it and as the site loaded and I started reading, I immediately knew that this was something that I wanted to try to expand and broaden my martial arts knowledge and experience. I submitted a contact-me request to the website. Shortly thereafter, I received a reply from Shihan Martin Day. His e-mail was positive and inviting, but the two requests he had was, first, that I needed to be aware that he taught something a bit different to what I was used to (excellent! that’s what I wanted) and, secondly, that I wear a white belt to class. I realized that the request to wear my white belt, instead of my brown belt was most likely because, firstly, Shihan Martin didn’t teach Shotokan and I had earned my belt in Shotokan and secondly, because it was probably a test. This strengthened my resolve to be humble and to show respect, two philosophies taught to us by Sensei Eugene as well as being an integral part of of Shotokan Karate (please refer to the Dojo Kun if you are not sure what I am talking about). Still, it felt quite weird to wear the white belt again, after having left it behind in 2010 already! Shihan is a Japanese term, often used in Japanese martial arts as an honorific title for expert or senior instructors. The term is frequently used interchangeably with English terms such as “master instructor”. Thus, excited about the adventure my family and I were about to embark on, we boarded the airplane for the 12 hour flight to Sydney. 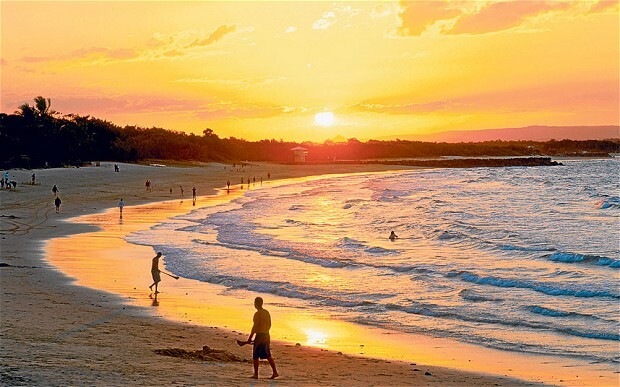 The next day, after arriving in Sydney, we took a domestic flight to Maroochydore, where we took possession of the rental car and headed towards the company house in Noosa, where we would spend the next 2 months. (It turned out to be more like 4 months, but more about that in Part 2). 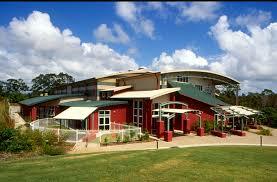 When I arrived a little earlier than my class started, at the Noosa Leisure Centre (an impressive sports facility, which includes basketball courts, rock climbing facilities, a boxing gym, a canteen and, of course, the Combat Karate dojo), I tried to take in as much as possible by observing the current kiddies-class, regarding the etiquette and so forth, so that I could fit in as soon as possible. Still, I figured that bowing before entering a dojo was standard across the globe, so that I did do . . . which of course, was the correct approach. Just one difference – where we say “Osu!” when we bow and enter the dojo, at Combat Karate, it’s more of a “Ai!” or “Hai!” – referred to as a Kia (or a shout as we know it in Shotokan). The little differences were exhilarating to experience and I felt like a kid with a new toy, to be honest. I could scarcely contain my excitement. Immediately upon entering the dojo, a man, whom I recognized as Shihan Martin from his photos on the Combat Karate website, walked towards me. His eyes and demeanor were friendly and he was welcoming, yet efficient in his communication with me – something I took as probably typical of a combat veteran that spends his time teaching people how to defend themselves! As soon as the lesson started, I knew that I had been thrown into the deep end. Our warm-ups were fast and multifaceted, but almost every single person in the class, whether 10 or 50, could split. A little bit embarrassed I tried my best, but with everybody a few inches off the ground – my head stuck up above the rest of the class like a meerkat on the African savanna. Still, I did what I could and persevered.. The self-defense techniques were up close, fast and required precision. Knowing where to position oneself was key to successfully executing the strikes, blocks, pushes, pulls and throws. The katas resembled the Shotokan Hein Katas in terms of their Embusen and there were similarities with the specific moves and the count (number of moves). The katas were referred to as Shodan, Nidan, Sandan and so forth, thus dropping the “Heian” prefix. Fortunately, I was allowed to perform the Shotokan versions of these katas, which worked out well – since , as I mentioned, the number of moves were the same for each. I realized after a little while that 2 months was never going to be enough for me to fully get to know all the facets of the art of Combat Karate, but I enjoyed the learning process and took out of the lessons what I could, such as positioning, distancing and strike and pressure point selections. About two weeks into the training, Shihan Martin came to me and said, “Morney, you may wear your brown belt the next time you come to class“. I felt honored by the gesture and resolved further not to let him or myself down, and to continue to do my best in each class. Shihan Martin also offered an outdoor training course, which doubled as a grading day for his club. 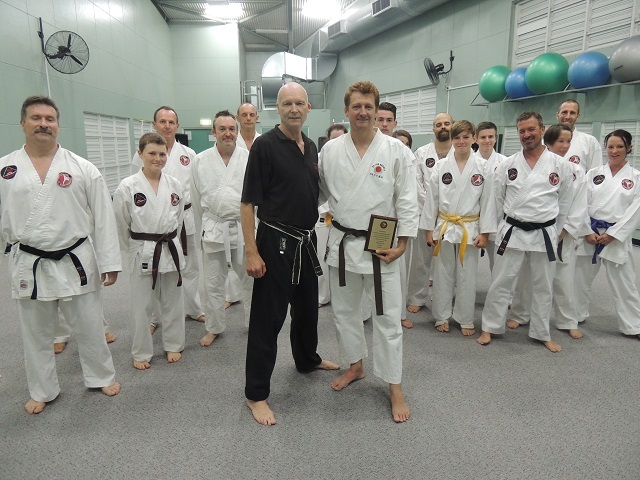 I was humbled when Shihan Martin offered to sponsor me and allowed me to participate in the training day – especially since the exchange rate was R10 for each Australian $1 ! At the outdoor course, we did fitness and learned a whole lot of things, including some techniques involving the use of a short stick known as a Kali Stick, I think, (about 71 cm in length), which was very interesting. In addition, I was allowed as an observer when all the students performed their grading test at the end of the outdoor course. A great privilege for me indeed. What was also so incredible about the entire 2 month experience, besides the knowledge I gained from the Shihan Martin, was the humility and respect that his students and their shihan showed towards me and each other and towards their shihan. Shihan Martin, being an experienced combat specialist, had no reason to treat me with such respect – after all, I was the student and he the master – yet he did and he, his family and his students always – without fail – made me feel welcome and like part of the club. Courteous and caring behavior was demonstrated in each and every class between the students, even though the training was tough and mentally challenging. There is simply so much to remember about the various techniques taught at Combat Karate, that I could never in detail describe in this post the things we practiced. Instead, I have included a YouTube video at the end of this post, made by Shihan Martin and his team which demonstrates some of the techniques. After about 2 months in Australia, I heard from my company that I had to stay an additional 2 months to continue work on the project, and so I had to make a decision whether or not to continue to do Combat Karate or whether I should find a Shotokan club. Since I was preparing for my Shodan (and still am as of writing this post) , I realized that I needed to find a Shotokan club in order to ensure that I continue practicing the techniques required for my Shotokan Shodan grading. I had already missed my Shodan grading twice in the past year due to having to travel abroad and I wanted to try and get the Shodan grading done in 2015, which meant staying focused on my training no matter where I was in the world. Shihan Martin gracefully acknowledged and agreed that I needed to maintain my Shotokan training and not “stay out of it” for too long, so I had to end my brief, but incredibly informative and fantastic experience at Shihan Martin Day’s Combat Karate. 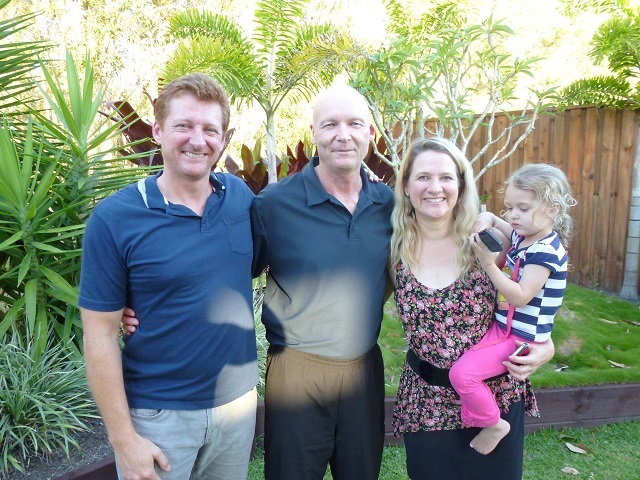 Shihan was kind enough to invite me and my family to his house for an incredible farewell lunch, which he and Sensei Patricia – his wife and the senior teacher (next to Shihan Martin) in the class – put together. Learning from Shihan Martin is an experience I will never forget and I am proud to count him and Sensei Patricia among my friends. 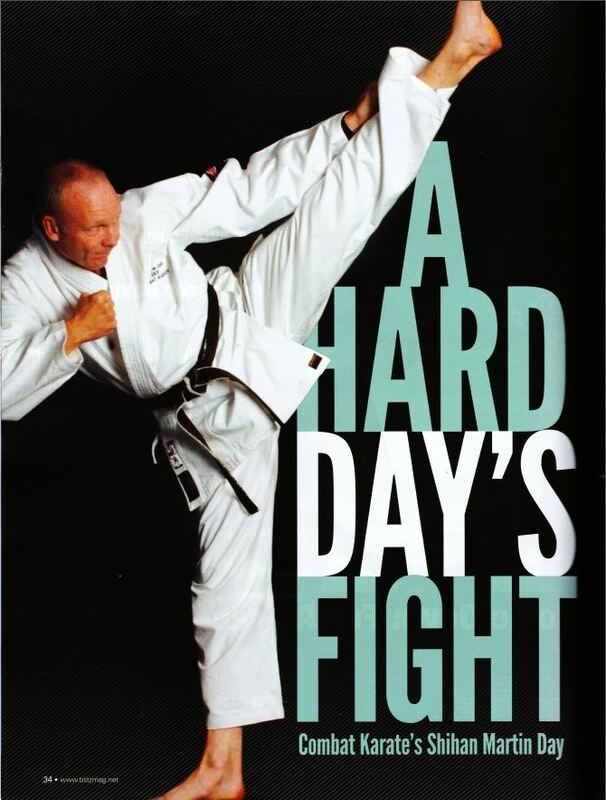 After completing 20 years of service in the British Army, which includes time spent with the Special Forces, Shihan Martin Day founded Combat Karate in 1996. 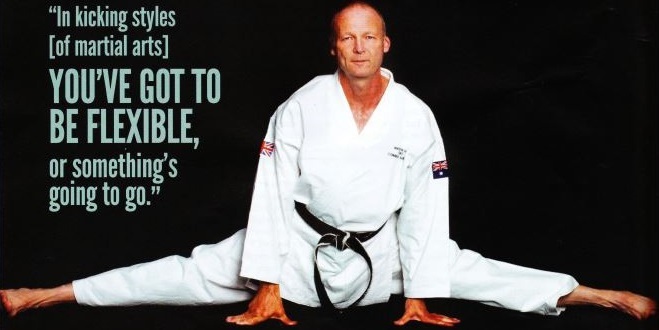 He first taught in the UK, moving to Sydney and opening his school in 2004, eventually moving to Noosa, in Queensland, Australia, where he teaches Combat Karate today. The techniques were drawn on his own experience, but bears similarities to Panuntukan, Kyusho Jitsu, Shotokan and British Army Unarmed Combat, among others. The following video demonstrates some of the techniques against both armed and unarmed assailants. If you’re ever in Australia, please do yourself a favor and look them up. 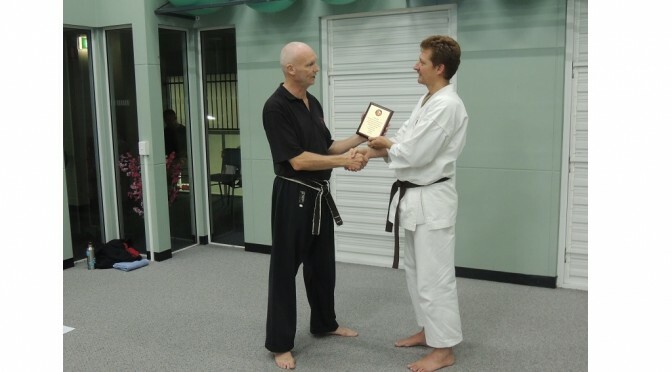 You can continue to read about my Australian martial-arts experience in Part 2 – where I found a Shotokan Club in order to continue my training.